These chocolate pecan tarts are about to become one of your favorite tart recipes. 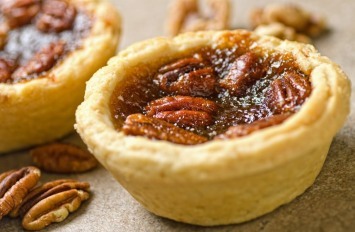 The take pecan tarts to a whole new level with the addition of a bit of wonderful chocolate. Ooey gooey tarts with chocolate – does that not sound like something near the perfect food? It does to me! Everyone will be asking for more of these nutty chocolate tarts. Combine the corn syrup, brown sugar, eggs and melted butter. Stir until blended. Arrange tart shells on baking sheets. Spoon 1/2 tablespoon each of chocolate chips and walnuts into the tart shells. Pour in the filling. Bake for 20-25 minutes or until the filling is just set and golden brown. The original recipe calls for 2/3 cup liquid eggs, but I changed it to whole fresh eggs. You can use either. 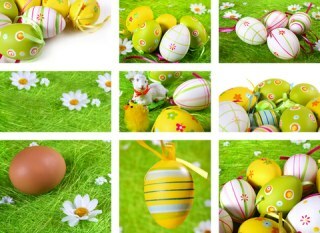 1/4 cup liquid egg = 1 large egg, so 2/3 cup liquid eggs is about 3 eggs. For best results, don’t skimp on the quality of the chocolate. The better the chocolate you use, the better the tarts will taste. Okay, I’ll agree that this isn’t the healthiest recipe in the world, but everyone needs a treat sometimes and a serving of this pecan tart is not very large. To make them even smaller, use mini tart shells instead of the 3″ shells. The recipe will make at least 48 of the mini tarts. I like to make my own pastry for tart shells, but sometimes convenience reigns and I reach for the frozen ones. Suit yourself as to which you choose. And if you choose convenience, don’t feel guilty. You are still making an amazing dessert that everyone will love. And using frozen shells makes this recipe quick and easy. You will find more easy tart recipes here. Click here to add your own favorite recipes.